Having trouble getting a friend or family member’s cat to warm up to you? Many cats are very friendly and affectionate, but they can be a little hesitant to trust people when they first meet. The good news is, by learning how to approach cats in a friendly and non-threatening manner, you can make new feline friends wherever you go. 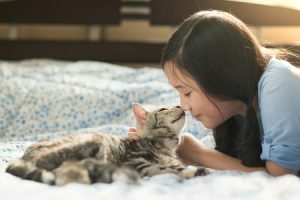 It might be tempting to try to pet a cat as soon as you meet them, but behavioral studies have shown that cats often respond better to people who sit back and let them make the first move. If you want to get on a cat’s good side, give them a chance to get to know you on their terms. You’ll typically get a much better response if you don’t overwhelm them with attention right away. Learn where cats like to be pet. Dogs might like to be scratched on their hindquarters, but cats tend to get nervous when people get too close to their tails. Instead, try to make first contact by rubbing their foreheads and cheeks. You can also give the cat an opportunity to sniff your finger as they would sniff the nose of another cat or dog to greet them. Back off if they aren’t in the mood to socialize. If the cat just doesn’t seem interested in getting to know you, it’s generally best to give them some space and try again later. Being too persistent can ultimately backfire and make them feel nervous around you. Just be patient and wait for a time when they feel more inclined to socialize. Cats are curious creatures, and before too long they’ll be ready to come over and say hi to their new friend.